0.5-2.5 cm broad. Conic to obtusely conic to conic-campanulate with an acute umbo. Margin translucent-striate, incurved and sometimes undulated in young fruiting bodies, often darkened by spores. Surface smooth, color variable, extremely hygrophanous. Usually dark chestnut brown when moist, soon drying to a light tan or yellow, occasionally with an olive tint, margin sometimes with bluish or olive stains. Surface viscid when moist from a separable gelatinous pellicle. Attachment mostly adnexed, sometimes adnate or seceding. Close to crowded, narrow. Color pallid at first, rapidly becoming grey, then brownish and finally purplish brown with the edges remaining pallid. 30-100 mm long by 0.75-3 mm thick. Slender, equal, flexuous (curved or sinuous), and pliant. Pallid to more brownish towards the base, where the attached mycelium may become bluish tinged, especially during drying. Surface smooth overall. Context stuffed with a fibrious pith. Partial veil thinly cortinate, rapidly deteriorating, leaving an obscure evanescent annular zone of fibrils, usually darkened by spores. Often this zone is entirely absent. Spores, Dark purplish brown in deposit, ellipsoid, 11-14 by 7-9 microns. Basidia 4-spored. Pleurocystidia few to absent. Cheilocystidia 18-35 by 4.5-8 microns, lageniform with an extended and flexuous neck, often forked. From when the fall rains begin until the first freezes. Liberty caps like cool temperatures, around 50 degrees Farenheit and lots of rain. Psilocybe semilanceata grows in north temperate areas but it has been found in Peru, Pune, India, Australia, New Zealand and also at altitudes of 4000 meters in Italy. Grows In fields where cattle graze, they will be in the larger greener clumps of grass, or in parks and golf courses.They like the water that the plants funnel down to the base of the plant and tend to hide there. Growing singularly or in troops. Bruising will appear at the base and on primordial aborts attached to mature specimens. Likely the most popular magic mushroom in the world. 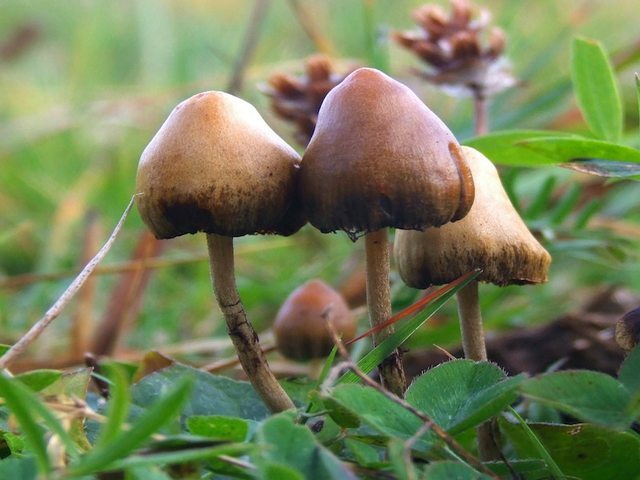 Psilocybe strictipes is a psilocybin mushroom which grows on grassy meadows and lawns; It is found throughout the cool temperate and subarctic regions of the Northern Hemisphere and it is most common in Europe, and the Pacific Northwest. It is closely related to Psilocybe semilanceata and Psilocybe pelliculosa. Psilocybe strictipes is commonly confused with Psilocybe semilanceata and can be differentiated by its lack of a papilla and a convex to subumbonate cap. "Strictipes" comes from the Latin words stricti (narrow) and pes (foot). The Cap Psilocybe strictipes cap is 5 to 30 mm across, conic to campanulate to convex, smooth, and translucent-striate near the margin, often with a low umbo. It is walnut brown to dark rusty brown, with a smooth surface and a separable gelatinous pellicle. It is Hygrophanous, fading to buff as it dries. The flesh sometimes stains blue where damaged. Gills are gills are cream-colored when young and dark purple brown when mature, with an adnate attachment. The spores are dark purple brown, suboblong, and 11 by 6 um. The stipe has a white to ocher, equal, tough, and cartilaginous structure with fibrillose patches. It is 4 to 10 cm long and around .25 cm thick. The partial veil is thin, cortinate, and does not usually leave any remnants on the stipe. Psilocybe strictipes fruits in late summer to fall in Chile, England, France, Germany, Holland, Slovakia, Siberia, Sweden, and the Pacific Northwest. Psilocybe strictipes is found in lawns and grassy fields but never growing directly from dung. Pileus 15-40mm in diameter conical at first, gradually becoming convex to subumbonate to subplane or somewhat depressed at the center but slightly upturned at the margin, glabrous, but in young specimens with minute fibrillose scales from the veil along the margin, even, but slightly striate at the margin when wet, viscid, with the pellicle seperable, hygrophanous, warm-buff or pinkish buff, light blonde brown to cinamon buff, olive brown. Often tinged green when touched. Lamellae adnate or adnexed, with slightly decurrent ends, whitish, light greyish or dingy yellow, finally purplish brown or greyish violet brown, with whitish and subfloccose edges. Stipe 50-70mm cylindrical, equal or nearly equal frequently composed, uneven, silky white, dry fibrous, especially below the annulus, furfuraceous punctate above, stuffed or hollow, base strigose or with white rhizomorphs. Veil well deeloped as a white foccose coat, forming a more or less permanant or evanescent white silky annulus, very thin and delicate. Spores 9.9-12 x 6-7um subellipsoid both in side and face view or somewhat inequilateral in side veiw, thick walled, yellowish brown with large germ pore. Purple brown in deposit. Psilocybe liniformans is a widely distributed mushroom in Europe, however this species of Psilocybe is very rare. It is in the section semilanceata of Psilocybe. The cap is 1 - 2.5 cm convex to nearly plane, and is sometimes broadly umbonate but not papillate. It is smooth, dull grayish brown to slightly olivacous, more reddish at the center, hygrophanous, and becoming straw brown when dry with the center remaining more brownish. It sometimes has a bluish green tone, or olivacous tones at the margin when young. The gills are adnexed, subdistant, broad, and dark chocolate brown to purplish brown with age. The spores are dark purple brown, ellipsoid, and 13 - 14.5 by 7.5 - 8.8(10)um. The stipe is 1.4 -3.0 cm by 1 %u2013 2 mm, equal, enlarging at the base. It is whitish to very pale brownish, darker below, bruising blue, and finely fibrillose in the lower portion. The partial veil is thin and soon disappears. The taste is weak to somewhat farinaceous; The odor is strongly aromatic to farinaceous. Microscopic features: The basidia are 4-spored and pleurocystidia are absent. The cheilocystidia are 22 - 33 by 5.5 - 9 um, lageniform and have an extended neck. Psilocybe liniformans var. americana is a very rare variant of liniformans that grows in America. It is found scattered to gregarious in rich pastures or grasslands, fruiting from summer to early winter. It has been collected in Washington, Oregon, and Michigan, and has also been reported from Chile where it fruits in the spring. This mushroom is very close to the type variety; the main difference is the lack of a gelatinous layer on the edge of the lamellae and the terricolous habitat. The spores are dark purple brown, ellipsoid, and 13 -14.5 by 7.5 - 8.8(10)um. The stipe is 1.4 - 3.0 cm by 1 %u2013 2 mm, equal, enlarging at the base. It is whitish to very pale brownish, darker below, bruising blue, and finely fibrillose in the lower portion. The partial veil is thin and soon disappears. Microscopic features: The basidia are 4-spored and pleurocystidia are absent. The cheilocystidia are 22 -33 by 5.5 - 9 um, lageniform and have an extended neck. 6... 7... 8... 9... 10. Other types of mushrooms in liberty cap fields. One Deadly shroom here so check it out !